I wish I were, but alas, I'm no stranger to grief. Grief isn't easy. But sometimes, writing about it, can help heal or at least put the pain into perspective. Jessica Handler has written a compassionate, compelling and deeply helpful book for anyone facing grief and wanting to write about it. 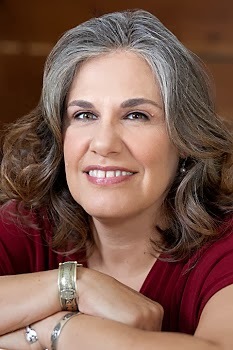 She is the author of Invisible Sisters and Braving the Fire: A Guide to Writing About Grief and Lost. Invisible Sisters was named one of the "Twenty Five Books All Georgians Should Read and was Atlanta Magazine's Best Memoir of 2009. I'm so honored to have her here to talk about the book that Vanity Fair called, "A wise and encouraging guide." 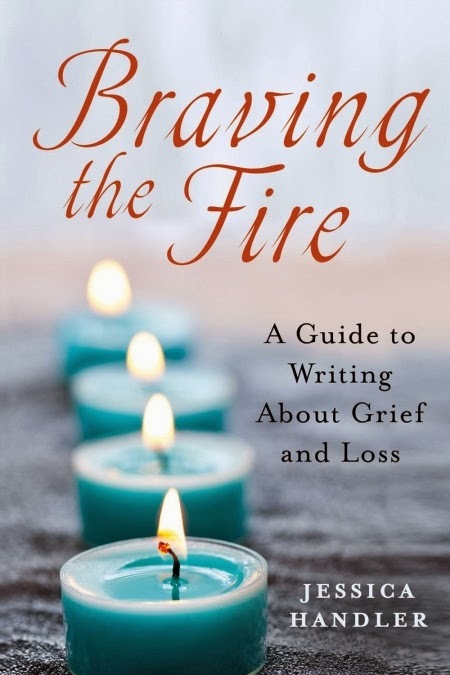 What is so great about Braving the Fire is that it talks about grief from a writer's perspective instead of a more clinical one. Can you talk about that please? I’m not a clinician, but because I grew up in a situation where doctors, prescriptions, and medical terminology were a part of my family’s life, so I’m conversant in a certain level of “medical speak.” I’m also acutely aware that in clinical environments, there’s an unfortunate tendency to consider a patient or family member as an illness or a diagnosis rather than as a person. That’s sometimes reinforced by the use of clinical language, which can be de-humanizing. Writing about ourselves and the difficult experiences that have changed us requires that we see ourselves and write about ourselves as what we are – as people. For writers, techniques like detail – the sensations surrounding the time you took the dog’s leash down from the peg for his last walk – or character – finding an empathetic element in the person who sold your friend that fatal dose of drugs – brings a story fully to the page. That’s some of how a personal narrative becomes universal. You write about being "transformed by loss." How are people transformed and what happens if they get stuck in their grief? How can writing help? Grief, which isn’t only death and dying, but all kinds of loss, changes who you thought you were going to be or how you thought your life would work out. There you were, living your regular life, and this thing happened. Maybe you’re uprooted by war or environmental disaster, maybe your romantic relationship ended badly, perhaps an illness or accident or addiction (which is an illness) has changed your story. That’s what transforms us, against our will. For those of us who want to write about who we were and who we have become, writing is our way of examining how we’ve changed. It’s exactly what you say; that stories are what saves us. I've long felt that stories are what saves us. Are their stages in writing about grief that lead to healing? In Braving the Fire, I applied the Elizabeth Kubler Ross “Five Stages” of Grief as a kind of scaffolding for beginning to write about what I sometimes call “the tough stuff.” I don’t subscribe completely to the idea that we all experience grief in a specific, linear, way. I’ve spent plenty of time in Depression, but very little in Denial, for example. Most people, though, are familiar with the “Five Stages” as a concept. I added a sixth stage, “Renewal,” that relates purely to writing. So, in Braving the Fire I write about how that first stage, Denial, can be seen as denying yourself the prerogative to write. I give examples of how denial stopped me, at first, and other memoir writers, and then writing exercises and prompts to overcome that. Anger has to do with character and interrupted life. I loved applying the third stage, “Bargaining” to research techniques and to form. We bargain with our work – and it bargains with us – about what will go into a manuscript and what we’ll leave out, and figuring out the form a piece will take is also a bargaining process. That sixth stage that I made up, “Renewal,” is about learning to recognize yourself as a writer who has built a bridge between who you were before the loss and who you have become in its aftermath. You talk about how some people burn their journals of grief, and it's funny, although I cannot bear to look at the journals I wrote when someone I loved died, I can't let them go either. Can you talk about that, please? I’ve kept journals since I was about nine, and I still have them. I read through them when I wrote Invisible Sisters in order to get a sense of who I was as a little girl, teenager, young woman, as my sisters’ lives went on around me (and then as they died.) I didn’t write for months after my sister Sarah died, and that gap in my journal writing was, in a way, a representation of my voice unable to speak. Maybe people can burn or otherwise discard their journals because they don’t want to look back, or find it too hard (it can be very hard!) or they want to make a new start without any reminders. What's the most important thing you would like readers to take away from your book? I’d like readers to come away from Braving the Fire feeling confident in writing about the difficult subjects in their lives, and knowing that they’re not alone in their desire to do so. I like to think that the more I have on my plate, the more productive I am. I try to write about two hours a day, first thing in the morning, which for me is around 7 a.m. If I get those few hours in, I feel settled, and then I can focus on other responsibilities. I teach creative writing at Oglethorpe University here in Atlanta, and I lead writing workshops on line and in person around the country, so there’s preparation and reading that I want to focus on without fretting that I haven’t written. I have a studio in my house, but I find that if I’m writing an essay, I sometimes do that better at a coffee shop. With earplugs. And a soy cappuccino. There was a category on my elementary-school report cards called “Uses Time Wisely,” and I’ve never forgotten that. I was always proud when I got a check mark in that column, but I have no idea what the standard was. I’m pretty obsessed lately with making sure that I am present in whatever I’m doing, including giving myself time to space out and think and just be. In yoga it’s called witness consciousness. I’ve noticed my attention span is getting kind of fried, so I’m thinking about enforcing a “digital Shabbat” for myself one day a week. In writing this book, I reached out to friends and mentors and people I hadn’t met but I admired their memoirs about loss and trauma. I wanted to talk with them as a writer about how they managed to write so beautifully and clearly about their own difficult subjects, and with permission, included their insights and salient excerpts from their work in Braving the Fire. I talked with about twenty people overall, including Abigail Thomas, Nick Flynn, Natasha Trethewey, Lee Martin, Rebecca McClanahan, and Katharine Weber, because their work mattered so much to me as I learned to write my story. I feel strongly that there’s a community of writers who address this subject, and I wanted my readers to know that community exists.